A most exciting pen for people of all ages. Just tap the pumpkin head and a bright LED light pulsates on and off. 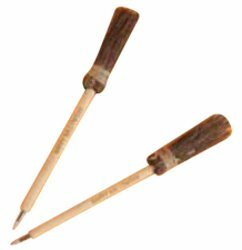 With your custom imprint on the barrel in the minimum of 250 they are less than $ 2.25 per pen. 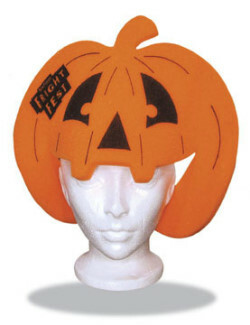 Our Pumpkin Shape Foam Hat is made of polyurethane open-cell foam and along with the orange foam it is also available in 12 other foam colors and can be imprinted in your choice of 18 different colors in the imprint area of 3" X 3". In the minimum of 100 they are less than $ 2.65 each. 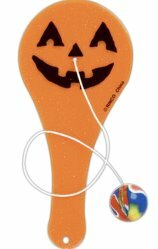 The 4 1/2" Pumpkin Paddle Ball is a very inexpensive hand out for trick or treaters. Less than $ 1.00 each without an imprint and less than $ 1.15 each with your custom imprint. The Skeleton Keychain is 4" long and it provides an imprint area on the oval disc. Less than $ .85 each in the minimum of 300 with your imprint. 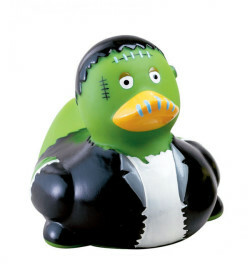 Minimum order on our custom imprintabler Halloween Ducks is 150 and they are less than $ 3.00 each. From left to right is the 3" wide X 3 1/2" high X 3 1/4" diameter Halloween duck and it provides a custom imprint area of 1 1/4" wide X 1/2" high. In the middle is the Frankenstein duck that is 3" wide X 3 1/2" high X 3" diameter and it provides an imprint area of 1" wide X 1/2" high on the tail. The far right picture is that of the Witch rubber duck that is 3" wide X 3 1/2" high X 3 1/4" diameter and the imprint area is 1 1/4" wide X 1/2" high. 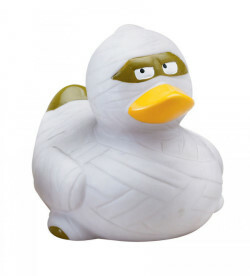 On the left is the Mummy rubber duck that is 3" wide X 3 1/2" high X 3" diameter and the imprint area is 1" wide X 1/2" high on the tail, Middle picture is the Pumpkin rubber duck that is 2 3/4" wide X 3 1/4" high X 2 3/4" diameter with an imprint area of 1" wide X 1/2" high. 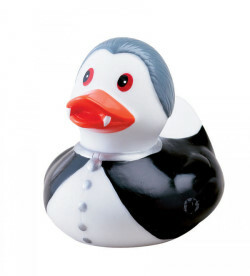 The picture on the right is the Vampire rubber duck and it is 2 3/4" wide X 3 1/4" high X 3" diameter and the imprint area is 1" wide X 1/2" high imprinted on the tail. 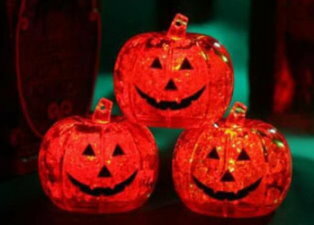 Our colorful 4" Glow Sticks can be custom imprinted in an area of 2 1/4" X 1 3/4"for that special Halloween event in quantities as low as 200 and they are less than $ .90 each in that quantity. 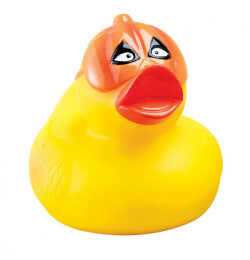 Available in Aqua, Blue, Green, Orange, Pink, Purple, Red, White and Yellow. Two styles of our ever popular Halloween glasses to choose from. 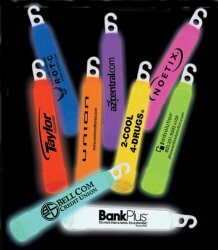 These are an inexpensive promotional giveaway and can be custom imprinted in quantities as low as 250. In the 250 quantity they are less than $ .70 each. 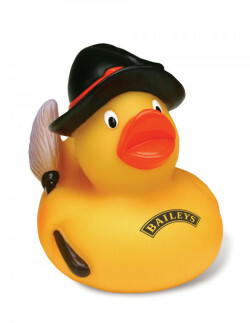 These hand crafted stress relievers are a great way to promote your company, hospital, school or organization. 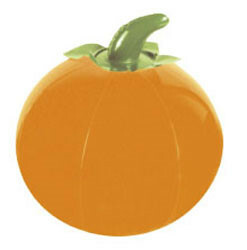 The Pumpkin stress ball is 2 1/2" in diameter and the imprint area is 1" wide X 3/4" high on the back area. 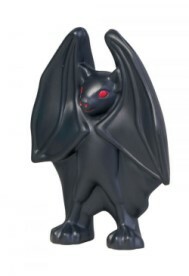 The Vampire Bat stress reliever measures 3 7/8" X 4 7/8" X 1 1/2" and the imprint area is 1/2" on the back. Minimum imprintable quantity on either product is 150 and they are less than $ 2 each in the 150 quantity,. The Pumpkin Flashlight measures 8 1/2" X 1 1/8" and the imprintable area is 3/8" X 2 3/8". In the minimum of 50 with a one color imprint they are less than $ 4.25 each. Pricing includes 2-AA Mercury free batteries. On the right the Glow In the Dark Flashlight is available in two sizes; a 6 1/4" X 1 1/8" with an imprint area of 3/8" X 2 1/2" or the other size is 7 3/8" X 3" with an imprint area of 1/2" X 2 3/4". Minimum imprintable order on either is 50 and the smaller size is less than $ 2.75 each with the larger size being less than $ 4.50 each.Both of these come with Mercury-free batteries.. 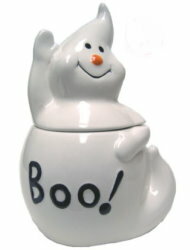 The Halloween containers come in assorted only and measure 2 3/4" high. Great fun for the young and old alike. Available with a custom imprint in the 1" X 1/2" area or may be purchased without a custom imprint. In the minimum custom imprintable 2 oz. size in the 250 quantity they are less than $ 1.00 each. Below are three Halloween related in-stock cookie jars available for immediate shipping in the minimum quantity of 12 for any of the three. 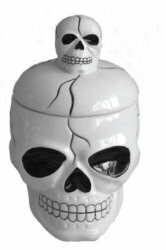 The Skull jar measures 5" X 7 1/2" X 5 1/2" and is less than $ 12.50 each in the minimum of 12. 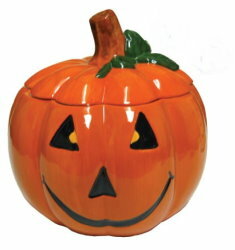 The Pumpkin jar is available in a 4.8" X 5" size and in the 12 minimum is less than $ 11 each. It is also available in a larger size of 7" X 8" and is less than $ 20 each in the 12 quantity. On the far right the Bjar measures 4 1/2" X 3 1/2" X 6 1/2" and in the 12 minimum is less than $ 12.50 each. 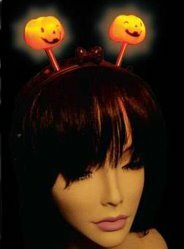 Blinking light pumpkin boppers are all the rage. The pumpkins are attached to a head band that stays secure. The slide switch located behind the bow on the headband has a switch for off and on controls. CPSIA compliant! Less than $ 3 each in the minimum of 36. The Pumpkin Bubble Pen provides an imprint area of 1" X 1/2" and the minimum imprintable quantity is 250 and they are less than $ 2.00 each. These 4" mini stuffed pumpkins have a clip on them and when you hear them you will hear spooky sounds. Minimum order is 36. 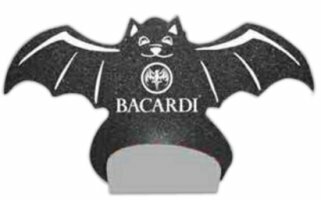 The Bat foam visor provides an imprint area of 3" X 2" and with a one color imprint is only 100.They are less than $ 1.70 each in the 100 minimum. 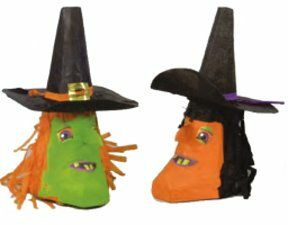 In the minimum of 12 the 20" Witch Pinatas are less than $ 11.00 each Also available in a pack assortment of 2 witches, 2 ghosts and 2 pumpkins at $ 6 per pack with a 18 pack minimum All pinatas are emptyand you can stuff candy, etc into each pinata. The 2 1/2" diameter lollipop can aslo be printed on a 1 1/2" label. In the minimum of 144 they are less than $ 2.75 each. The 7 1/2" Witches Broom Pen won't fly away but they are an ideal inexpensive Halloween give-away. Less than $ 1.35 each in the minimum of 100. 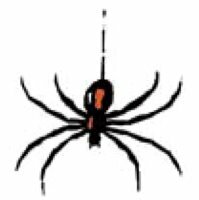 The 2" X 2" Spider Tattoo is FDA certified, and CPSC and ASTM compliant. Less than $ .15 each in the minimum of 1000 and that includes a one color imprint on the back of the product. Pricing on orders of 25,000 is $ .05 each. 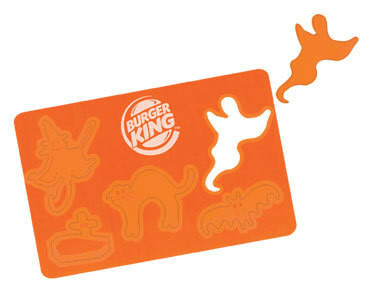 The Halloween Stencil measures 5" X 7 1/2" and is a great inexpensive product for schools and Halloween related events. In the minimum order of 250 they are less than $ 2.00 each. Available blank or with your custom imprint the Pumpkin Shaped Water Bottle in the minimum of 96 is less than $ 1.25 each. 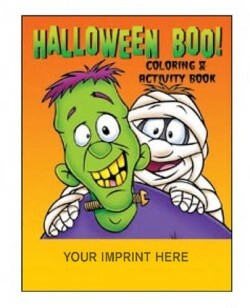 Our 16 page Halloween coloring book measures 8 1/2" 10" and provides an imprint area of 1 3/4" high X 7" wide on the bottom of the front cover. Minimum custom imprintable order is 250 and they are less than $ .70 each in that quantity. 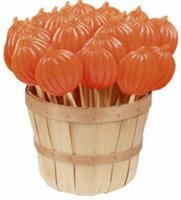 The 1 5/8" Light Up Pumpkins are available with a custom imprint or as a blank product. In the minimum of 144 with a custom imprint they are $ less than $ 2.65 each. Pumpkins that are printed use a medical grade ink. 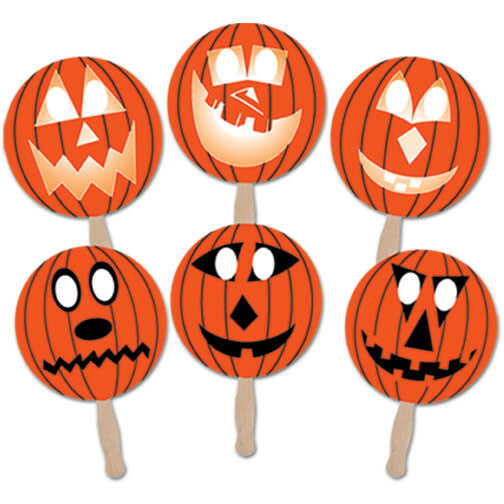 Our Pumpkin fans are liquid laminated for a high gloss finish and can be custom imprinted in the minimum of 250 and they are less than $ .75 each in the 250 quantity.. 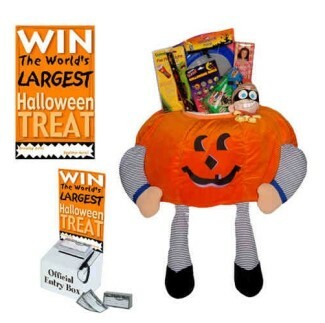 The Three Foot Halloween Pumpkin is filled with 65% licensed and name brand toys and the promotion kit includes all sweepstakes material of a ballot box, 500 entry tickets and one poster announcing the event. Great promotion for stores and restaurants. Minimum order is one and they are $ 160.00 each.. 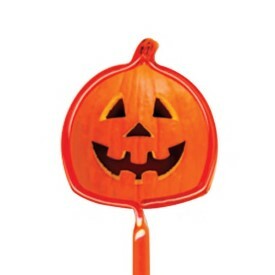 The bent shape 7" Pumpkin pen provides an imprint area of 3" wide X 5/8" and the minimum imprintable quantity is 250 with the cost being less than $ 1.60 each.. 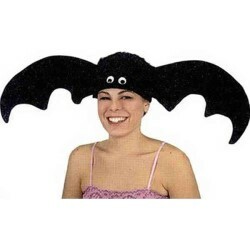 The Bat Hat is available in a minimum of 72 and is not custom imprintable.It is less than $ 7.00 each in the 72 quantity. 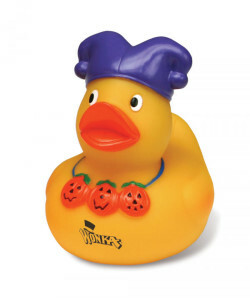 Our 12" inflatble pumpkins can be used over and over. No need for any messy carving on these. They can be custom imprinted in an area of 5 1/2" 2 3/4" and in the minimum order of 50 is less than $ 2.50 each. 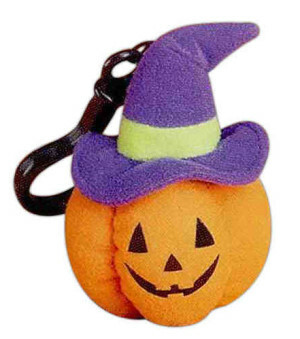 Our Pumpkin Zipper Pull is a practical item for those trick or treaters that will keep your company or organization's name in front of the child all year long !. This large reflector clips unto ski jackets, warm-ups and outerwear zippers. It provides easy zipper action when wearing gloves or mittens. Trick-or-Treaters can be seen from hundreds of feet away in the headlights of approaching motor vehicles whether it is worn on Halloween or any other night of the year. The size is 2" X 2" and provides an imprint area of 1/4" X 1 3/4" and is flouorscent orange with a black imprint. Minimum imprintable quantity is 250. The top row pictures our 11" X 18" Coupon Bags which are great for giveaways for those trick or treaters. You can put an imprint under the stock logo and also in the free coupon area. The secound group of three bags is that of just a few of our standard design 11" X 15" Halloween bags and each bag denotes where your imprint can be placed. Minimum on any of these bags is 1000 with your custom imprint. 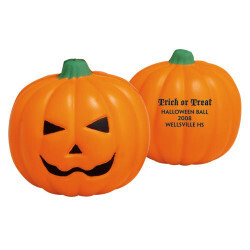 These reflective pumpkins can be imprinted with a standard pumpkin face or your custom imprint. They are self sticking and can be applied anywhere. They work well on clothing, skateboards, bikes and trick-or-treat bags. They are sold 36 to a perforated sheet or individually if custom imprinted. Minimum imprintable quantity is 100. 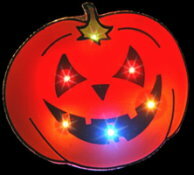 The actual size of each pumpkin reflector is 1 1/8" with an imprint area of 3/4". Available in either a n Adult or kids size the Halloween toothbrush in the minnimum of 288 is less than $ ,95 each. The pet hat can be custom designed. However the minimum order is 5000 with a 90 day delivery. Less than $ 3 each in the 5000 quantity. 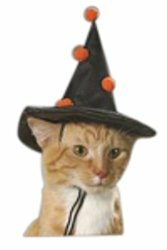 Give us a call at 800 960-9080 or 206 285-5359 or email us at donace@promotionalproductsandideas.com and we will send you a Halloween catalog.